TWO studies by heating specialists Kanthal AB have demonstrated the reliability of Kanthal APM radiant tubes in furnace applications in the automotive industry. Both applications are located in Barcelona, Spain - one at Nissan's plant for heat treatment of transmission parts and the other at Gearbox del Prat, the central manufacturing unit of gearboxes for SEAT. The heat treatment shop at Nissan has two gas fired, double chamber furnaces with 24 radiant tubes in each, installed vertically with the burners at the bottom. Heat treatment is carried out at 910°C-920°C in a nitrogen methanol atmosphere. Production runs consistently with planned maintenance three times per year. 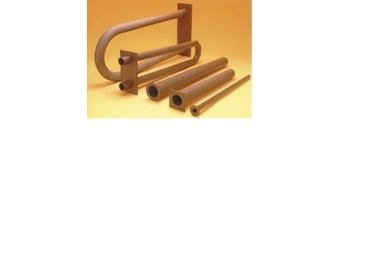 Original nickel chromium radiant furnace tubes failed consistently, sometimes lasting only four months and causing up to three days downtime for replacement on each occasion. Alternative specification nickel chromium tubes were tried without improvement. Kanthal APM radiant tubes, produced in Kanthal's iron-chromium-aluminium alloy (Fe-Cr-AI), were then installed in the first chamber of one furnace, where the temperature variations and power requirements are at their highest. After 18 months of trouble-free operation, the decision was made to change all radiant tubes to Kanthal APM, The result has been a substantial improvement in furnace reliability and reduction in downtime. Heat treatment at Gearbox del Prat is carried out in four continuous gas fired pusher furnaces and two smaller, batch furnaces. The four continuous furnaces run at 880°C-930°C with endogas atmosphere, heated by natural gas. Originally equipped with silicon impregnated silicon carbide inner tubes and nickel chromium outer tubes in the recuperative systems, Kanthal APM tubes were installed as a trial in one furnace. Compared to the original system, Kanthal APM tubes had a longer lifetime and no tubes had to be exchanged during production periods. Overall, they have out performed the previous system, the lifetime is superior and the rating is higher. The smaller gas heated batch furnaces complement the large continuous furnaces. Again Kanthal APM tubes have been installed and lifetime is superior to the previous ceramic tubes. A particular advantage of Kanthal APM tubes is that air can be blown into the tubes for rapid cooling, since they are not affected by thermal shock.